Squirrel Proof Bird Feeder S Poles stop squirrels and make Squirrel Proof Bird Feeders. This Squirrel Proof S Poles series has a Slot & Pin design to securely connect their pole sections together. When the pole sections are slipped together to make the pole, these slots & pins align with one another. The poles can come with squirrel baffles or raccoon baffles below to stop the squirrels and raccoons from climbing the pole. The Bird Feeder Pole Systems can be bundles of poles, bird feeders, weather baffles above and pole baffles below. Squirrel Proof Bird S-Pole Quad has 4 hanger arms, 4 clear weather baffles, a cylinder squirrel baffle, and ground socket anchor. 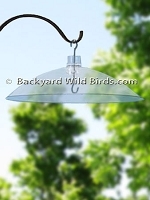 Your Bird Feeders under the 16" Clear Baffles will have great protection from the weather. 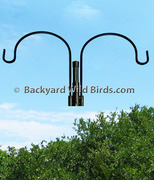 Bird Feeder Pole System S7 is a double hanger arm with bird bath and third hanger arm below. 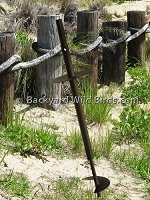 This bird feeding pole system is an S-Pole kit that has unique slot and pin secure joints. Bird Feeder S Pole Double Arm with two hanger arms is a versatile pole ready to hang Hummingbird feeders, thistle bird feeders, hanging plants or use with a pole squirrel baffle of your choice. 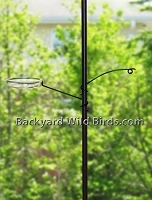 Bird Feeder S Pole Top with double hanger arms. Can be use by itself or added on top of an existing S Pole Double hanger Arm within this category. 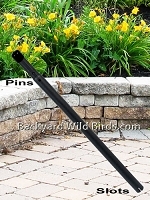 Bird S Pole 12 Extension for 1 in. diameter S Poles only. Its overall length is 16" and it extends the pole height of an existing pole within this category by 12.5" . Bird S Pole 30 Extension for 1 in. diameter S Poles only. Its overall length is 34" and it extends the pole height of an existing pole within this category by 30" . Bird S Pole Ground Anchor for 1 in. diameter S Poles only. Ground Anchor for mounting 1 inch outside diameter bird feeder S poles and secure with slot & pin joint. Hanger Arms Twist On for Bird Poles and wrap around any 1 in. dia. bird feeder pole. Very nice to be able to add extra hanger arms to a pole system. 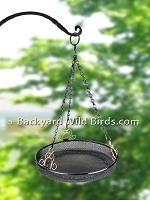 Hanging Tray Bird Feeder is an open bird feeder that invites a large variety of birds. The tray bird feeder has micromesh design to allow water to pass thru to keep seed dry and fresh. Squirrel Proof Bird Feeder S Pole has 2 hanger arms for bird feeders, a cylinder squirrel baffle, and ground socket anchor. Bird feeder S pole Series has unique slot and pin joints to secure all connections. Squirrel Proof Bird S Pole Quad has 4 hanger arms for bird feeders, a cylinder squirrel baffle, and ground socket anchor. 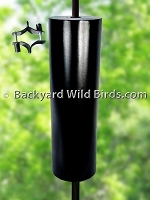 The 16" long cylinder squirrel baffle makes the pole squirrel proof. Squirrel Proof Quad Arm S Pole has 4 angled hanger arms for bird feeders and a cylinder squirrel baffle for poles. 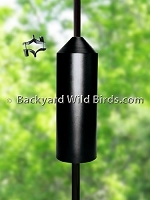 End frustration and solve bird feeder problems with this squirrel proof bird feeder pole.